We all start thinking about our instrument panels and paint schemes as soon as we start our planes, sometimes even before. I’m guilty of that too. I’ll likely paint this plane myself as I did the last two, and will also likely have the paint scheme figured out well in advance, I already have some ideas on it. I’ll post them on this page once I get it figured out. First we have to build the airframe though and that means a decision on whether to prime the components or not. Any RV builders reading this know that primer is a topic of endless debate among aluminum airplane builders. 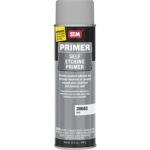 There are literally thousands of comments on various primers in the online forums. After all these years of listening to this debate, studying the various materials, and observing the protection offered by the primers I used on my RV-8, I will be using the exact same materials and regimen I used on my second plane, the RV-3, which is a self-etching primer from SEM. My experience has shown that it is effective, easy to apply and work with, and importantly, represents a good balance between the time investment in prep/application and the protection it affords. In deciding on the SEM for interior use I did consider the more thorough processes such as acid etch, alodine, and epoxy primer. In the end however, I decided that the materials listed above represent the best balance between the time investment and the protection they afford. 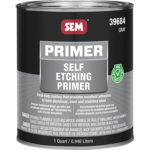 Regarding self-etching primers, I did informal testing with most of the commonly available self-etching rattle cans (Sherwin Williams, Marhyde, etc.) and found the SEM to be at least as durable as any of them, but left a nicer finish. Other builders who’ve looked at the interior of this plane really like the finish as well. Also, it is available in spray cans and liquid in both quarts and gallons. Steel parts clearly need some more aggressive form of protection, and the exterior primer will largely be a function of what paint system you or your painter end up using and is typically applied after construction anyway. 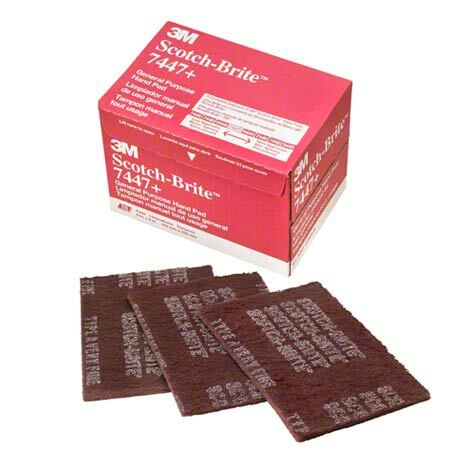 7447 Scotch-Brite pads, aka “maroon”, which you will use constantly for dressing edges and scuffing surfaces. Best to buy in the 20 pack! Regarding the SEM interior primer, I use the bulk product with my cheap HVLP spray gun for the larger parts such as the the skins and major bulkheads, and the rattle can version for all the small parts. Being able to shoot small parts as you need to assemble them can really help your productivity. 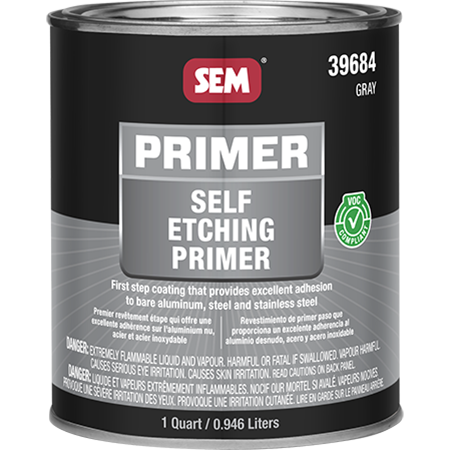 Even though this is an acid-etching primer, you still must prep the surface for proper adhesion. The method I use is to scour all surfaces of each part thoroughly with a maroon Scotchbrite pad wetted with Coleman fuel (naphtha) followed by a wipe-down with a clean towel slightly also wetted in clean naphtha. This gives the primer both “tooth” for mechanical adhesion, and a fresh pure aluminum surface for good chemical adhesion. That’s why you should prep soon before you prime so the aluminum doesn’t have a chance to oxidize preventing good chemical adhesion. Any of the major paint company’s degreaser solvents should work fine here also, they’re just three times the price of Coleman fuel. Not determined yet but I have some ideas. I’ll likely post a graphic here once I get at least a preliminary design done. Will likely stick with the PPG family. I researched this quite extensively back with my first plane and chose PPG and then learned quite a bit about how to use it. No doubt things have changed since then so I’ll get myself current and go from there. Painting an aircraft is not a small undertaking, there are lots of considerations and things to provide for. I’ll post the path I end up taking here.